A 69-year old man was referred to our endoscopy unit for exclusion of gastrointestinal bleeding. Laboratory investigations revealed a haemoglobin level of 7.8 g/dL (reference value 14-17 g/dL). Family history for colorectal cancer was negative and the patient was free of symptoms. Colonoscopy was performed by using the newly introduced 700 series from Fujifilm (Düsseldorf, Germany). No signs of bleeding were noted. 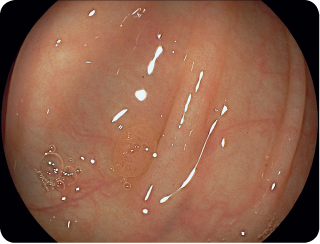 High-definition white-light imaging revealed a pale 5 mm polyp in the transverse colon (Figure 1). 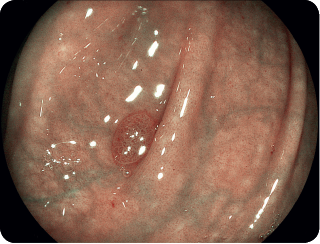 After switching to the BLI mode, the polyp and the borders of the lesion became clearly visible (Figure 2). BLI in combination with optical magnification revealed a typical Kudo Type 3S pit pattern suggestive of a tubular adenoma (Figure 3). This case illustrates the clinical benefit of the newly introduced 700 series endoscope with BLI and optical magnification for in vivo diagnosis of colorectal polyps. Although most diminutive colorectal polyps are hyperplastic lesions, the current case highlights the importance of an adequate in vivo characterisation of all polyps for an optimal management of our patients. Rex DK, Kahi C, O‘Brien M al. ASGE Technology Committee systematic review and meta-analysis assessing the ASGE PIVI thresholds for adopting real-time endoscopic assessment of the histology of diminutive colorectal polyps. Gastrointest Endosc. 2011;73:419-22. ASGE Technology Committee, Abu Dayyeh BK, Thosani N, et al. The American Society for Gastrointestinal Endoscopy PIVI (Preservation and Incorporation of Valuable Endoscopic Innovations) on real-time endoscopic assessment of the histology of diminutive colorectal polyps. Gastrointest Endosc. 2015;81:502.1-502. 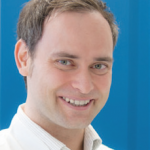 Neumann H, Mönkemüller K. Staining and magnifying the mucosa: are biopsies no longer required? Endoscopy. 2014;46:833-5.